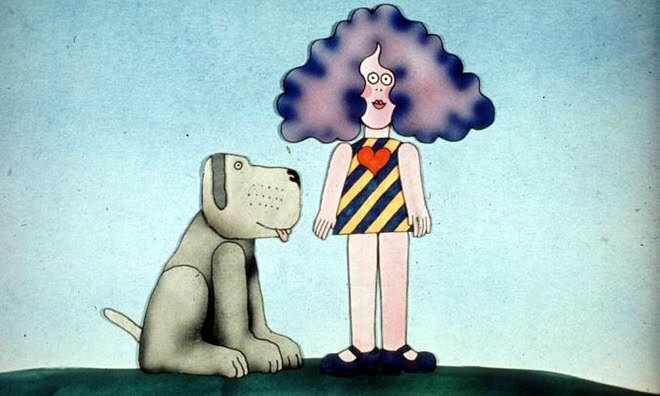 As I have got older I have tended to avoid wearing a swimsuit in public. Although I love swimming I hate having to dry my hair with a dryer as I end up looking like Crystaltips. I am also, like many people more than a little apprehensive about exposing so much bare flesh. Clothes are like my armour, I can use them to express who I am, cover my insecurities and highlight my assets. Without them I have a tendency to feel rather exposed and self-conscious Consequently the two swimsuits I own are the vintage kind with the little skirts (aka Mom swimsuits!). 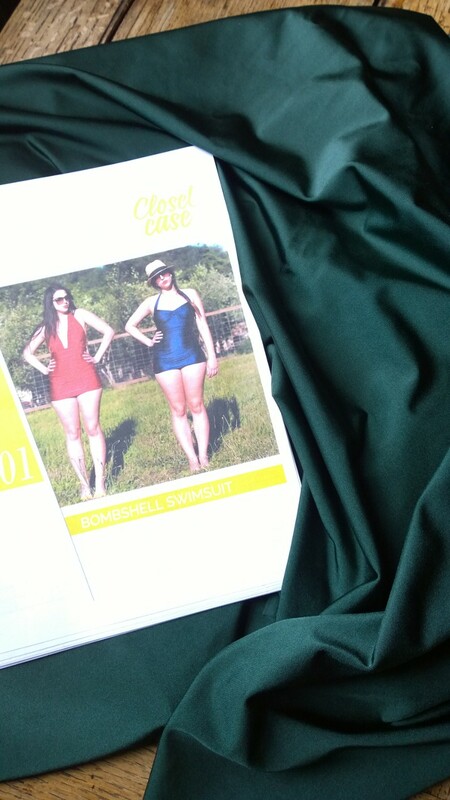 However, when Heatherlou’s Closet Case Files Bombshell Swimsuit pattern was released last year I was smitten by the design. I loved Esther Williams films when I was little and the bombshell has that vintage feel. In my favourite Esther film ‘Dangerous when wet’ she wears a white swimsuit which is a dead ringer for the Bombshell and she swims with Tom and Jerry in it! As more and more versions popped up on the blogesphere it became apparent that it was the holy grail of swimwear, super flattering with a good dose of old school glamour. The bombshell only became a necessity to sew with an impending holiday to Anglesey. Now North Wales is not really renowned for being tropical or glamourous but it does have beautiful beaches and even if I was only going to be paddling in rock pools I wanted to do it as glamorously as possible! My first hurdle was finding the fabric, swimsuit lycra is hard to come by in the UK but this Ebay seller had a fairly good selection of block colours. I was undecided between Navy, Wine or Bottle Green, after a few days pondering I finally plumped for the green. I also got a metre of slightly finer skintone lycra for the lining. I was really surprised at how much fabric was needed, two and a half metres including the lining. I also needed five metres of swimwear elastic and opted for the 8mm white rubber type as it looked (and was) easier to work with than the clear plastic I had used before. I used a ballpoint needle on my regular machine and also opted for the walking foot, I tried it without but it kept skipping stitches. 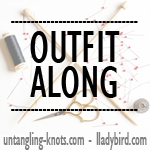 I followed Heather Lou’s sew-a-long which was brilliant. I cut a size 12 and graded up to an 16 over the bust. the pattern is brilliantly drafted and comes together so quickly. I used my overlocker for the side and centre back seams, there was a lot of fabric to cope with, four layers, two of which were densely gathered, there is a whole lot of ruching going on in this suit! I knew I would need a bit of extra support in the bust area. I looked at swimwear cups in my local haberdashery but even the large size didn’t look remotely adequate. 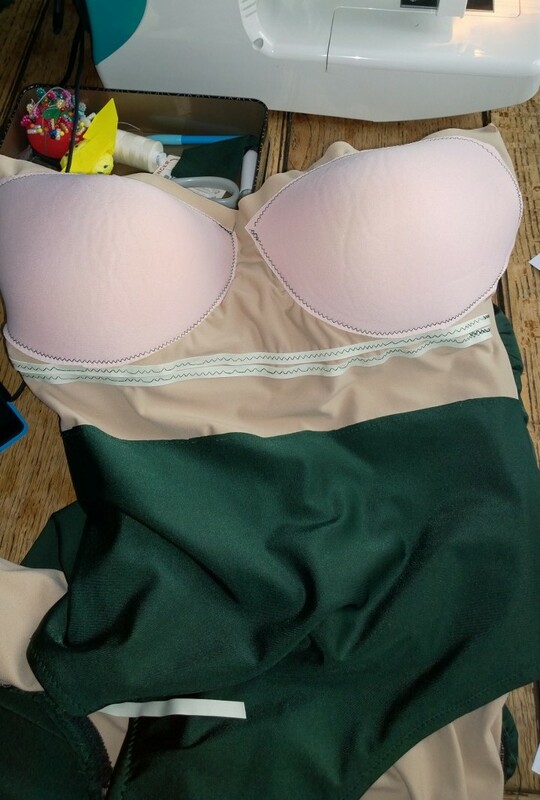 I ended up harvesting the cups from an old t-shirt bra and sandwiching them between the main fabric and the lining. 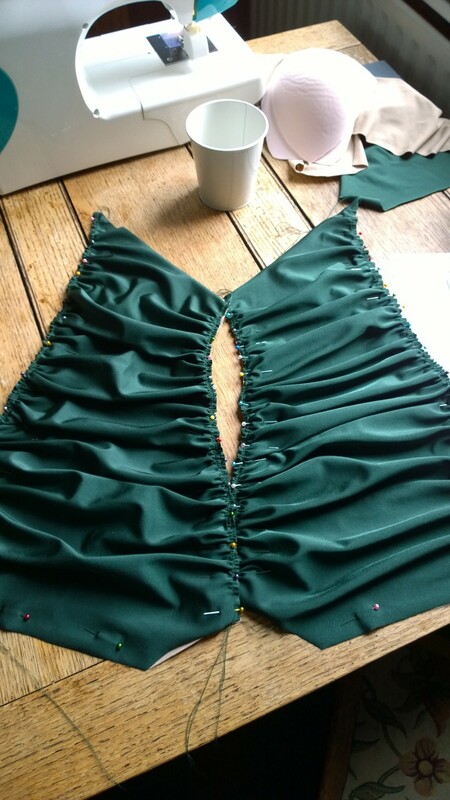 I also stitched two rows of the swimsuit elastic underneath the bust to act as a kind of shelf. I did plan to sew it over a couple of days but once I started I didn’t want to stop, I couldn’t believe how much fun it was to sew! I think it took about five hours in total, including coffee breaks. I initially basted the straps at the position given on the pattern but when I tried it on there was an awful lot of spillage! After a bit of repositioning I found the right spots which provided the optimum amount of support needed to keep the girls under control! So how did it fair on the beach? I was concerned about so much fabric holding a lot of water but it didn’t take long to dry out after a quick dip in the sea. I must admit to getting a bit nesh in my old age though, as I did spend most of the time sat in the beach tent happily knitting while Big Mr and Little Mr braved the waves and went body boarding! (Beach knitting is now my favourite holiday activity!) Although I did throw a couple of Esther Williams poses I didn’t get chance to do any graceful swimming as the sea was a bit too rough, I will just have to suffice with doing a few handstands in the local pool! The Bombshell fit is perfect and gives the right amount of coverage without looking at all mumsey, I did feel ultra glamourous and most importantly confident, I could potter about the beach without being self-conscious! My whole body image has changed so much since I started sewing again, if you had told me a couple of years ago I would be posting pictures of myself on the internet in a swimsuit I would have laughed (manically!) but now I have accepted my body for what it is. It has served me well for 43 years now, it’s strong and healthy and does what I want it to do without too many complaints. I’m getting old enough to realise that life is too short to get hung up on perceived imperfections and we should really be amazed at what our bodies can do. Has sewing for yourself changed how you feel about your body image? 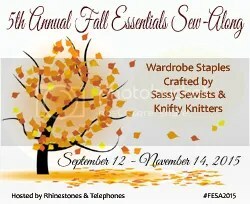 This entry was posted in Finished Sewing Projects. Bookmark the permalink. I love your swimsuit! I have been considering making this pattern for a while but now summer seems to be over and i am not going anywhere sunny so i think it will have to wait another year! I think you are right about sewing influencing your body image, I know my measurements and I can work with them and make something that fits (and hopefully flatters) rather than struggling in changing rooms with sizes that come up too small for me or dont account for the fact that I have two sizes difference between waist and hips! It really is a great pattern and so much fun to make you, should give it a go! Your right about shop changing rooms, they are a nightmare that I’m glad I don’t have to endure anymore, I always left empty handed and slightly depressed! Thanks Tracy, it was rather windy so I had to plait my hair, put it up and wrap a headband round it just to keep it under control! It was such a relaxing holiday though, I love being by the sea! Oooh, I really love that green color! And I think you look fabulous in that suit! 100% old school glamour! The costume looks FAB and I so agree with your closing comments – with age comes a subtle combination of confidence and couldn’t care less attitude linked to knowledge of how precious and short life is. I have had SO much fun since hitting my fifties including a more daring dress style. Looking forward to seeing the completed knitted item too! Thanks Joanne, your so right, life is to short to worry about the superficial things and having a couldn’t care less attitude is so liberating! I’m knitting the Peggy Sue cardigan btw, hoping to get it done while we still have a bit of summer but if not I think I’ve got enough yarn to make the sleeves longer! You look very glam in your Bombshell and so glad you shared with us all. Love the colour and good to hear about knitting at the beach, definitely my preferred activity at the beach. Thanks, glad I posted it after all! 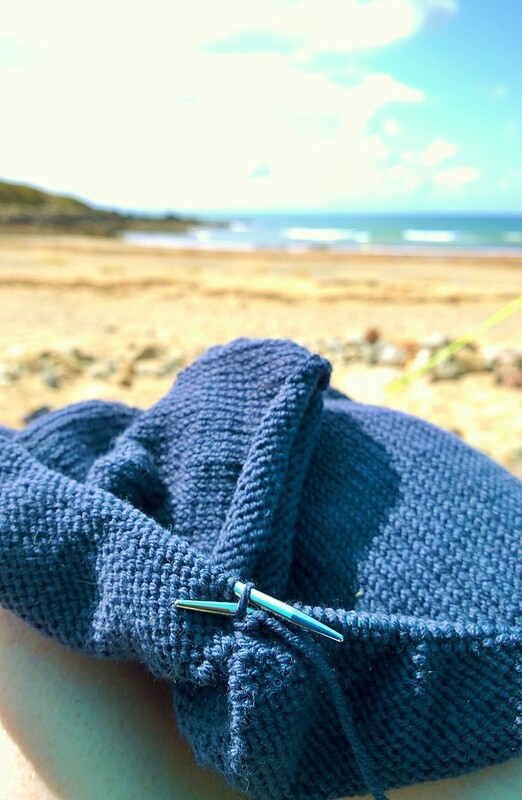 Knitting on the beach was so relaxing, wish I lived closer to the sea so I could do it more often! What a fabulous Bombshell! I love the color and it looks gorgeous on you. This pattern is going on my list for next Spring! Thanks Teri, I never knew Lycra could be so much fun, you should definitely make one! I love you swim suit and you comments and your Esther Williams poses! We are so lucky to have this attitude towards ourselves so that we can happily live on sewing and blogging and enjoying the sun on the beach! Thanks! 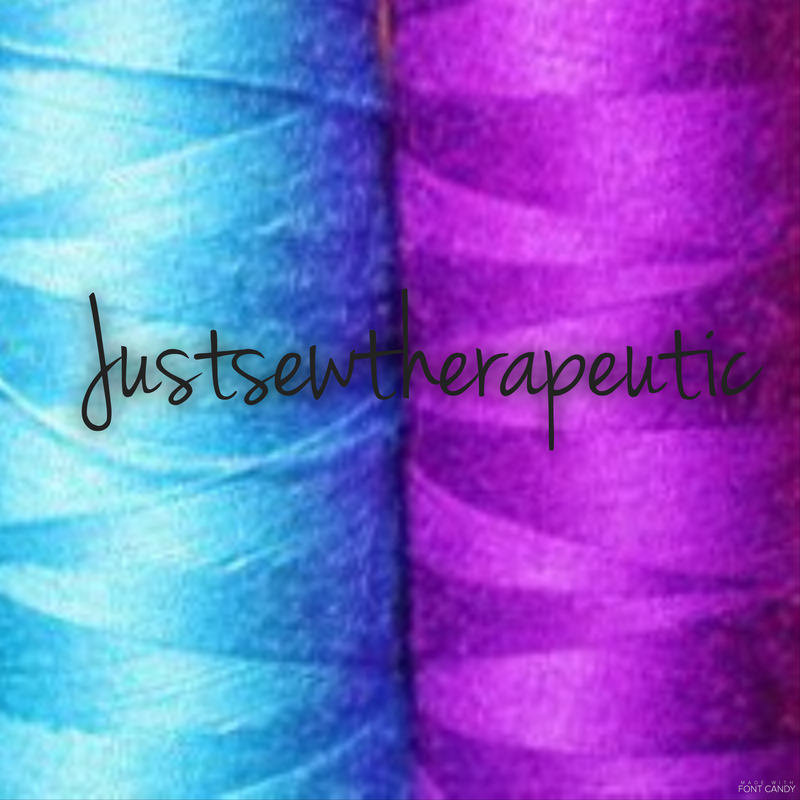 There is such a positive vibe in the sewing community, the world would be a much better place if we organised it! This is fabulous! You look fantastic in it and I totally agree with your thoughts about body image. I hope you had fun posing on the beach because you look like you were! The Crystaltips comment really made me chuckle, that’s what my husband calls me!! Beautiful job on the new suit; you look amazing! Thanks for not only showing the inside details but for sharing the end result. You’ve inspired me to keep working on my own fitting issues. So glamorous!! The colour is perfect on you – it looks fantastic! You look amazing, and I love the colour. Fabulous.